Small business owners and entrepreneurs understand the critical role of efficient and reliable broadband access. It ensures and supports critical day-to-day operations like customer orders and communications, marketing, vendor payments, shipping, workforce management, financial controls and more. What if we can help small businesses further by increasing broadband speeds that are 100 times faster; dramatically increase battery life of devices; and boost capacity for much larger amounts of data and information? This is the future with 5G, and it means historic new opportunities for the nearly 29 million entrepreneurs and small businesses across the United States. Ensuring 5G is made available quickly and successfully includes striking the right balance of policies that oversee infrastructure deployment at the federal, state, and local levels. In particular, identifying and freeing up adequate amounts of high-, mid- and low-band spectrum – the invisible airwaves that carry wireless communications – is no easy task. There’s only so much spectrum, and it takes years of collaboration and coordination to identify, and get to market, bands that will work for our evolving wireless needs. Over the last several years, there has been commendable progress by the Federal Communications Commission (FCC) to make more spectrum available. On July 12th, the FCC will vote on a Notice of Proposed Rule Making (NPRM) that focuses on freeing up mid-band spectrum – more specifically within the 3.7-4.2 GHz band – for commercial wireless use. 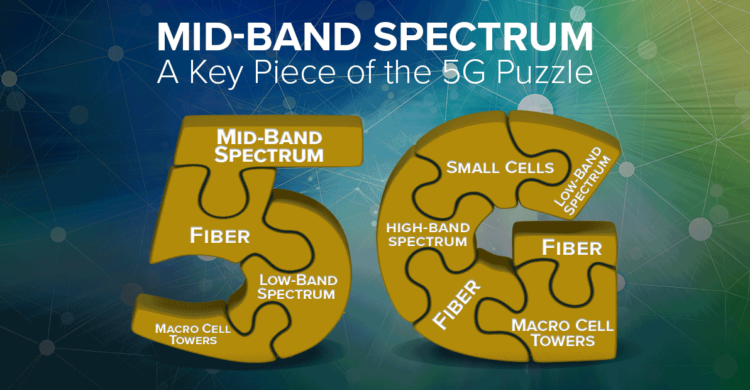 This is critical for 5G because mid-band is a key piece of the puzzle for this advanced, next-generation technology. While high-band spectrum can carry a significant amount of capacity and low-band can cover large areas, mid-band is the best of both worlds in that it can carry a lot of information over larger distances. It’s this combination of spectrum that will help make it possible for small business owners to take advantage of innovative, next-generation technologies to build and grow businesses and reap the benefits of the digital economy. But the 5G puzzle is not just about spectrum. Physical infrastructure like fiber, macro cell towers, and small cells also have roles to play. In particular, policy frameworks must be modernized to allow for the efficient deployment of small cells, as this modern wireless infrastructure will be critical to delivering on the promises of 5G. Many policies remain outdated, burying small cell implementation attempts in red tape, including fees and process delays. So streamlining these processes is another critical step to making sure 5G happens sooner rather than later. The FCC made some progress on this front earlier this year, and Senators John Thune (R-SD) and Brian Schatz (D-HI) recently introduced a bill that aims to streamline deployment as well. Nearly 58 million people across the U.S. are small business employees. That’s 47.8 percent of the private workforce. While entrepreneurs individually are “small,” together they make up the backbone of our economy. It’s critical that policies at the federal, state and local levels are forward-looking and open opportunities for this sector and the local communities that count on small business growth and success. 5G is one such example where there is tremendous opportunity to have a significant impact for the economy and local economic development. If done right, 5G will ensure more people start businesses, and existing businesses across the U.S. continue competing, growing innovating and changing the game for consumers and workers alike. The 5G Boost to Entrepreneurship and Small Business Growth: FCC Unveils Vital Plan for Deployment, Media Release, March 1, 2018. Enabling Private 5G Infrastructure Deployment: A Small Business Discussion with FCC Commissioner Brendan Carr, Small Business Insider blog post, March 16, 2018. FCC Action on 5G Means More Entrepreneurship and Faster Small Business Growth, Media Release, March 22, 2018. States Begin to Lay a Foundation for Private 5G Infrastructure Deployment, Small Business Insider blog post, April 3, 2018.